Afghanistan - Walking into the narrow, cramped courtyard of Shamsur Rahman’s home in Jalalabad city, it is difficult to imagine that his family of ten can live there. “I don’t know how I would have managed to return home without IOM since there is no public transportation stopping near my village and I cannot walk,” said Mani Rai, a 65-year-old Nepalese man who just came back to his home in Melamchi Village Development Committee (VDC) in Sindhupalchowk district through IOM’s Assisted Discharge and Referral Service. “The only option would have been my family carrying me all the way from downtown to home with a stretcher, which would have taken hours,” he continued. Italy - Some 102,000 migrants have arrived by sea in Europe this year, according to IOM. The number is slightly ahead of levels reached at this time in 2014 and reflects growing sea-borne migration from the Middle East and Africa, with most of the landings taking place either in Italy or Greece. 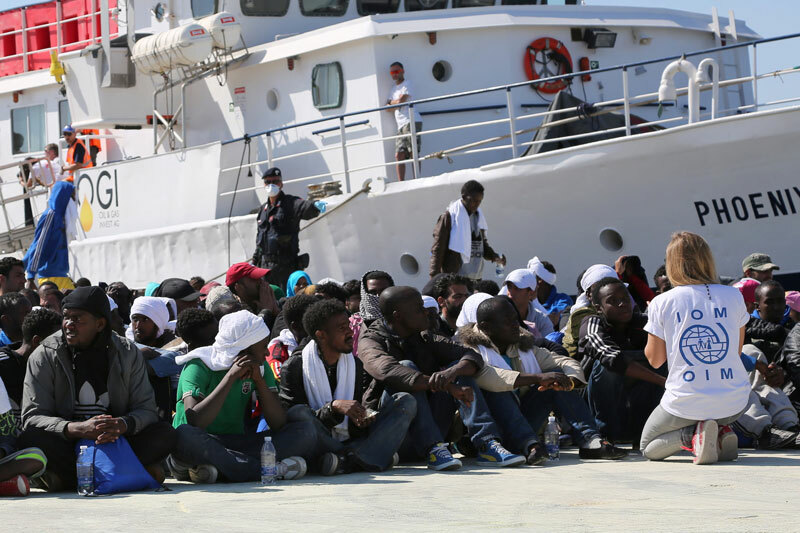 According to statistics compiled by IOM in the Mediterranean, 54,660 migrants reached Italy, after departing almost exclusively from Libya, while 46,150 migrants reached Greece, departing mainly from Turkey. My first instinct when I spotted the two women from a small community in Sindhupalchok marching towards me was that I should maybe stop taking photos of their shattered community; perhaps I was rubbing salt in their wounds. Over the past three weeks they’d seen their lives change forever, their homes destroyed, family, friends and neighbours killed, livelihoods wiped out. When our eyes met, however, my doubts melted away. One of the women raised her hands, palms touching and fingers pointing upwards: “Namaste”, she said, the customary form of Hindu greeting meaning ‘I bow to the divine in you’. Her pressed hands could not hide a shy smile, her eyes hinting that she was genuinely happy to see a foreign face like mine interested in telling their stories when help is most needed. The migrant crisis in Southeast Asia has gripped the attention of the world’s media. The human angle of these un-named thousands, on the open sea for weeks on end, has mved even the most experienced journalists. Agence France-Presse’s Christophe Archambault sailed out for an never-to-be-forgotten encounter with a boatload of migrants off the coast of Thailand. We reprint his blog by kind permission of Agence France-Presse. KOH LIPE, Thailand, May 15, 2015 - For us this story began several weeks ago with the discovery of a mass grave in southern Thailand, thought to hold the bodies of Rohingya migrants smuggled into the country from neighbouring Myanmar. The stateless Rohingya are one of the world’s most persecuted minorities according to the United Nations. Tens of thousands have fled Myanmar since communal violence broke out between them and the ethnic Buddhist Rakhine in 2012. Though the overall picture is murky, it is widely suspected that thousands are being trafficked out of the country on a route that runs via southern Thailand, where they are held by smugglers in squalid camps before being taken on, mainly to Malaysia. "There Are Different Kinds of Earthquakes"
Kathmandu - There are earthquakes that deliver a single or series of mighty jolts; others cause the ground beneath your feet to vibrate and tremble and defy you to stand. Today’s (12/5) earthquake was of a type I’m familiar with from Aceh, Indonesia, following the 2004 tsunami: a sudden shudder powerful enough to knock you off your feet, followed by a series of long, violent sine-waves that cause the land around you to rise and fall like a ship on a concrete sea. Nepal is a country on the move. Since Saturday, when the 7.8 magnitude quake rocked the Himalayan nation, people have been moving – to avoid aftershocks, to find a new place to live, or to find their loved ones. As soon as I saw the breaking news flash up on my phone I knew this was serious. I was packing my bag to go to Geneva for some scheduled meetings, but knew right away that my plans had just changed, changed utterly. I spent Saturday and Sunday on the phone assembling our team, and by Sunday night we were good to go. Forty years ago this spring, the world witnessed one of the turning points of the Cold War: the closing of the U.S. Embassy in South Vietnam, followed quickly by the panicked evacuation of Americans and their allies from the region and then the tragedy of hundreds of thousands of so-called Boat People fleeing from Vietnam into the South China Sea.